It did not seem possible that only 24-hours after posting a thread about mysterious notches, the notches would no longer be mysterious! You see, the exposed studs in the second-floor bathroom of the Cross House have three rows of horizontal notches. The notches are only about 1/8-inch deep. Obviously, they had some purpose. But what? For almost a year I have pondered these notches. I have asked many many people about them. No one had a clue what they were for. I replied that the second-floor bath did not have wood wainscoting. Or so I had always assumed. The kitchen did, servant’s hall, and the main pantry. But the MAIN BATHROOM certainly did not have so pedestrian a wall covering! Particularly when the first-floor bathroom has four-foot-high slabs of marble on the walls! So, I assumed the second-floor bath had the same, or perhaps gorgeous ceramic tile (like in a house a block away by the same architect). But Megan’s comment nagged at me. What if she was right? And my assumptions were, well, just that? So, I went downstairs to look at the wood wainscoting in the kitchen, servant’s hall, and pantry. The wood wainscoting in the servant’s hall. In the pantry my eyes bugged out. It has wood wainscoting (1). This is bare wood were a built-in cabinet once was. 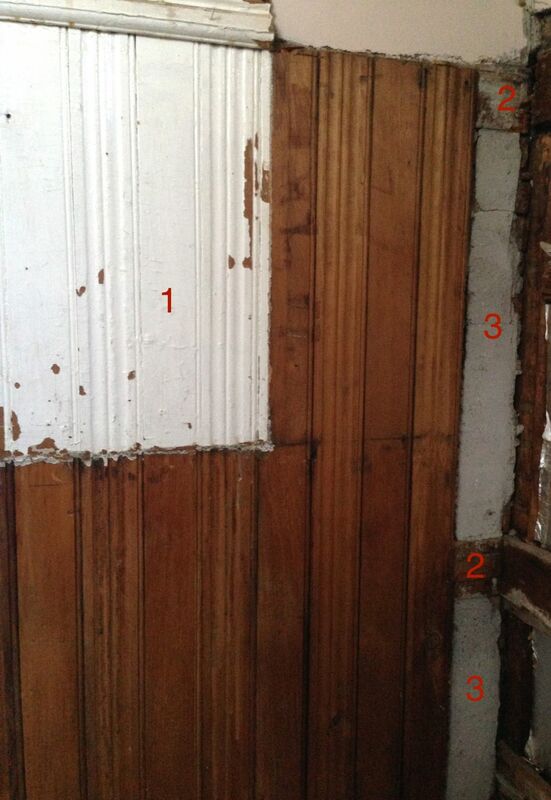 There is a corner where the wainscoting is missing (far right). And there, behold, are horizontal rows of wood nailers (2). And the nailers are inset into the studs about 1/8-inch. 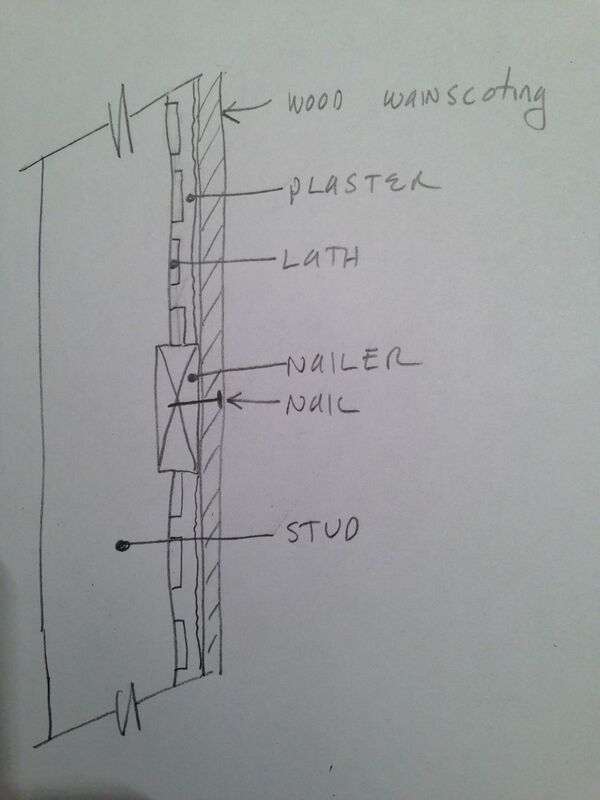 Above/below each nailer is lath on the studs, with plaster over (3). The plaster is flush with the nailers. We had to rebuild a wall in the kitchen (termite damage). 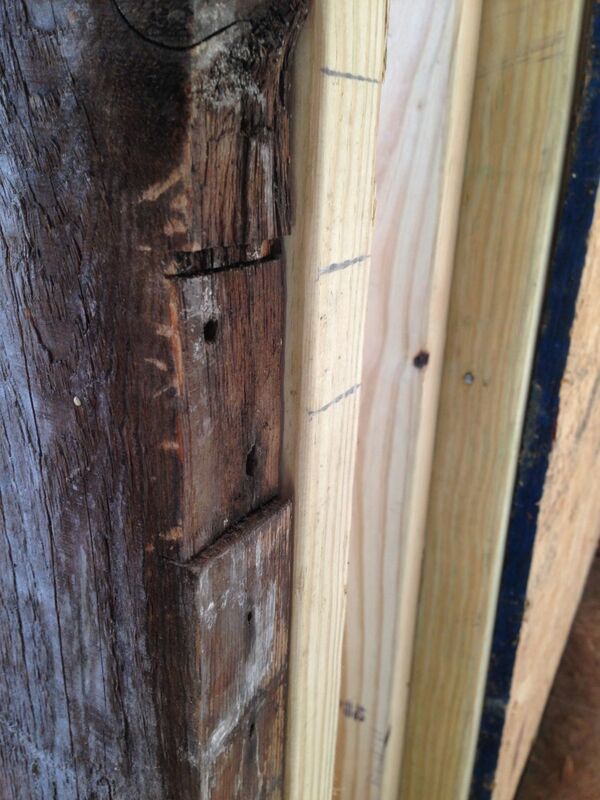 The original stud has the same notches where wainscoting was (and will be again). So, Megan was correct. The notches were there specifically to accept nailers, so that wood wainscoting could be attached. 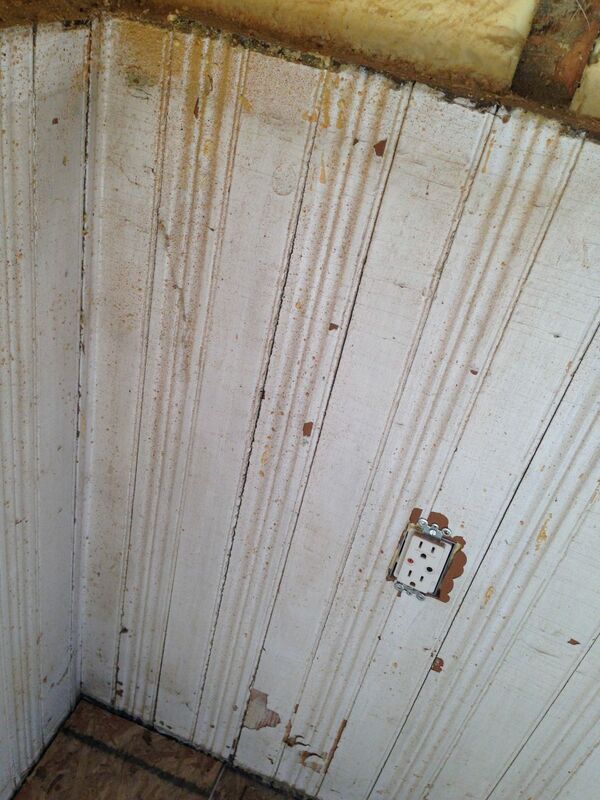 Thus…the main bathroom at the Cross House must have had wood wainscoting after all. I then realized that the marble bath downstairs was all for show. This is what guests would have used. It all now seems so obvious, and I feel like a first-class ding-dong. But I am delighted to finally understand the WHY of the notches. 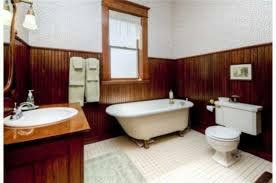 And I am terribly excited at the thought of recreating the lost wood wainscoting in the bathroom. What a thrill it will be to replace the long-lost nailers! Is is ironic that all this time I have been pondering the Great Notch Mystery and all the while the house already had the answer. I just wasn’t seeing. So, my bathroom would have looked sorta kinda somewhat like this originally. But with an encaustic tile floor! In my previous post I stated that the first person who figured out the Mystery Of The Notches would get a prize. And a kiss. I am uncertain how to kiss Megan as she lives across the country. However, after some pondering, I can send a prize and a kiss. At the online Hershey’s store, I will order a box of Kisses. Amy also mentioned wood wainscoting. Although her comments did not explain why the studs were notched, she was close to the answer, so she gets a gold star! 8 Responses to The Mystery of the Bathroom Notches: REVEALED!!! That’s TOTALLY what I said! That was what I was envisioning, and apparently, did a poor job of explaining when I was discussing how I thought the rails and stiles were affixed. Argh. I was right, and just not articulate I guess, but that’s exactly what I was trying to convey. 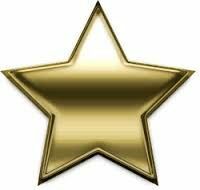 But I appreciate my gold star, friend. But I totally nailed this! And it is a BIG gold star!!! I think I was robbed. I’m not the robbing sort, nor am I the kissing sort, so I’ll share Amy! Aren’t I generous? Don’t I get a gold star for sharing well with others? You totally get a gold star, Megan! You were able to explain what I was thinking in my head better than I was! I’m so glad you solved the mystery! Rats! I was hoping for a pic of the KISS w/Meagan! LOL LOL delighted the mystery was solved! Aren’t puzzles FUN once you’ve figured them out? I would be happy to kiss Megan! But she is thousands of miles away! And her husband might object! LOL LOL A prize kiss doesn’t really “count”, does it?